Though the weather may still be cold, it’s now officially spring. You know what that means–it’s the time of year when people start returning to the city’s wide network of pedestrian and bicycle trails! This year, trail users have many reasons to be excited; there are quite a few projects going on to expand existing trails and create new ones. The Schuylkill River Trail will celebrate the opening of a new section in Roxborough with a ribbon-cutting on March 28, 2013. Also, construction is underway on the boardwalk that will connect the trail along the Schuylkill Banks from its current southern terminus to the South Street Bridge. 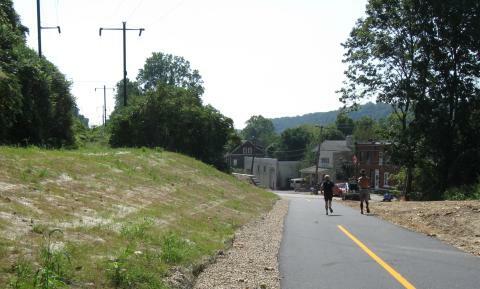 A new trail is in the works for the Schuylkill’s west bank in Kingsessing. The proposed Bartram’s Mile trail is planned to connect to the Grays Ferry Crescent trail over a now-defunct railroad bridge. The new trail will have two segments, Bartram’s Mile North and Bartram’s Mile South, on either side of the existing Bartram’s Garden portion of the Schuylkill River Trail. A portion of the trail that runs through the floodplain forest will consist of a pedestrian-only boardwalk. For a comprehensive look at Philadelphia-area trails, check out connectthecircuit.org, a website run by a coalition of “non-profit organizations, foundations, and agencies working to advance completion of a connected network of trails” in the region. Then, get out and explore! Whether you pick a trail you’ve never been to before, or one that you walk every day, make sure you take some time this spring to take advantage of the vast network of trails in the Philadelphia region!